Spotted Emu Bush is a survivor. I planted the first Eremophila maculata I found from a 5 gallon pot. It was merrily blooming in the dead of winter. My dog, soon to be infamous, dug the plant up and drug it about the yard. By the time I found it all that was left was a rootball the size of a 1 gallon pot. I planted that and it bloomed merrily for several months before the dog renewed his digging in this location. He trotted off with the plant again. Upon returning from work I noticed the pit where a plant should have been. Upon walking about the yard I eventually found a small chewed plant with maybe a few leaves on it and a rootball the size of a 2" liner. I planted it and spoke with it in most encouraging terms. Eremophila maculata rewarded me by coming back and growing yet again. Several months later the dog gave me a new pit. I searched the yard but could not find the plant this time. All future plants of this variety have been planted out of the reach of said dog. Eremophila maculata bloomed through the coldest period that we have encountered here. We got down to 16° F on successive nights. That dog's water turned to ice and was tossed onto a sunny spot on the lawn remaining there as a large bowl shaped cube for days. The Spotted Emu Bush was undeterred. Never mind how tough it is there are the flowers. They are an ornate spotted red. The 1.5" lanceolate leaves are an apple green. The plant is tidy and 4-6' in diameter. Eremophila maculata is a great one for the low maintenance garden, unless there is a dog with a penchant for digging. 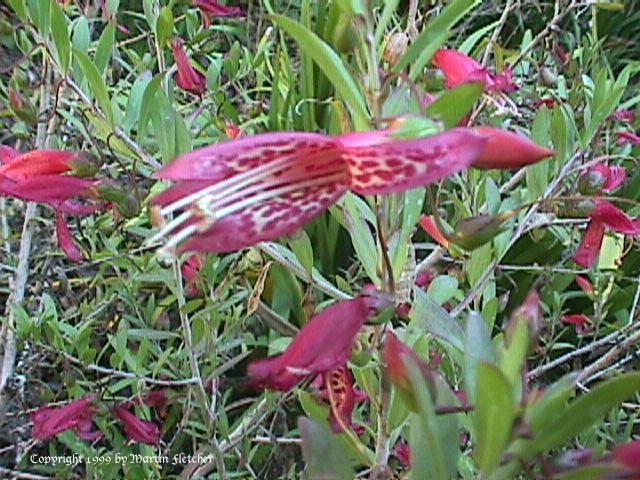 Eremophila maculata has several varieties on the market. A yellow form that is sometimes just called yellow, Eremophila maculata aurea. 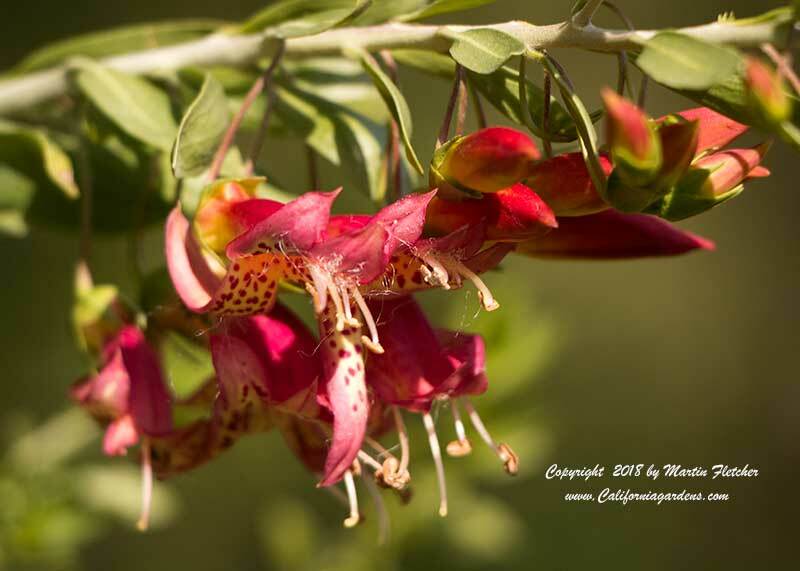 And two pink forms called Eremophila maculata Valentine, or Eremophila maculata Clementine. Red spotted flowers of Eremophila maculata the Spotted Emu Bush. High resolution images are available from our garden image collection. Red spotted flowers of Eremophila maculata the Spotted Emu Bush.